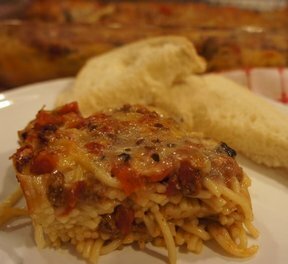 You won't even miss the meat in this Italian baked dish. Of course, if you want, you can add some cooked and drained ground beef with the tomatoes. Serve it with a side salad and garlic bread. In a large skillet, sauté onion and green peppers in butter until tender. Add tomatoes, mushrooms, olives and oregano. Simmer uncovered for 10 minutes. 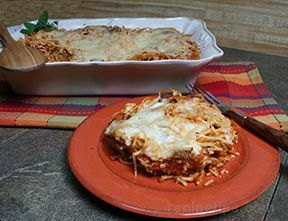 Place half of the cooked spaghetti in a greased 9x13-inch baking dish. Top with half of the vegetable mixture. Sprinkle with half the Cheddar cheese. Repeat layers. Mix soup and water until smooth, pour over the casserole. Sprinkle with parmesan cheese. Bake, uncovered, at 350°F for 30-35 minutes or until heated through. "I wasn't sure what the cream of mushroom soup would be like on the top but it is barely noticeable after it bakes. I think it filters into the pasta and keeps everything creamy. 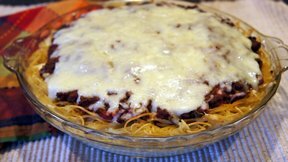 I did add ground beef and browned it with the onions and pepper."